When I started DCA 3 years ago, I wanted to bring together some of the best dance coaches in the country to share their knowledge to other coaches. My dad always says “surround yourself with others that make you better”….and I did just that with these mentors. We truly have the best coaches in the country as our DCA mentors. I wanted to take a moment to recognize two of those mentors. 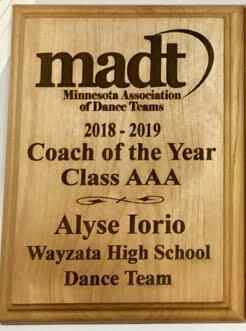 Alyse Iorio was just named the Minnesota Association of Dance Teams 2018-2019 Class AAA Coach of the year. Her team won BOTH jazz and kick this year at the Minnesota State Dance Competition. Those dancers are better for having you as their coach Alyse and we are so proud of you! Melissa McGhee is a graduate of The Ohio State University where she obtained a B.A. in Business Administration. She has coached The Ohio State University Dance Team for the past eight seasons. Under her direction, the team has consistently placed in the top five at the UDA Collegiate National Championship and won the D1A Jazz Division in 2018 and the D1A Pom Division in 2018 and 2019. After sixteen years of studio training, she now choreographs/consults for teams nationally and judges for dance competitions including NDA, UDA, AmeriDance, Showcase America, OASSA, and USASF Dance Worlds. Here is what Melissa’s nominator had to say about her. "Under her direction, Melissa led The Ohio State Dance Team to their first ever UDA National Championship title in both Division 1A Pom and Jazz at the 2018 national competition - something that has never been done in the history of OSU dance program. Additionally, she and her dancers were awarded one of The Ohio State University’s highest alumni awards, the E. Gordon Gee Spirit of Ohio State Alumni Award, for personifying excellence in representing OSU at school events, in the community, and on the national stage. She was instrumental in the formation of The Ohio State Dance Team Alumni Association which provides support and scholarships for the current dance team and former members." "Melissa has created a culture based on hard work, respect for self, respect for others, and a camaraderie that I have not seen in many other programs. She is constantly giving constructive feedback in a way that not only supports the athletes but is an effective leader that just gets it. While Melissa always has high expectations of her athletes, she also provides a number of resources to allow them to grow and progress each and every day." There is still time to vote for Melissa so head over to the NDCA website to vote today! I’m proud to have been on this coaching journey and DCA journey with both of you. We are in the planning stages for our next DCA Spring/Summer coaches online training session. To be notified when registration opens, head to our main page on Dancecoachacademy.com and enter your email to join our community of coaches! We can’t wait to see many of you in our next session! "You can't make your goals their goals"
I was sitting in an in-service meeting for my job as an instruction coach, and this bold statement was made. And I, like any other obsessed dance coach, immediately thought of my team, and had the stark realization that this is why my first few years of coaching were such a struggle. I mean, I eventually have figured out WHY they were a struggle, and have implemented many changes in my program, but never had someone put it so succinctly. My first few years as a coach, I had high aspirations. After having won several titles as a dancer, I would settle for no less than a national championship as a coach. I even went so far and said that my program would win a national title within my first five years. That first year I found myself banging my head against the wall CONSTANTLY. I knew what it took for me to win, why couldn’t my dancers see it? I was willing to sacrifice, to push, to do the extra, why didn’t they? It boils down to this… I wanted it more than they did. I was trying to make MY goals THEIR goals. I am a goal oriented person. I have always incorporated goal setting for my students in class, and the teams that I have coached. But when I moved up to the college level, there was a difference in how I approached it. 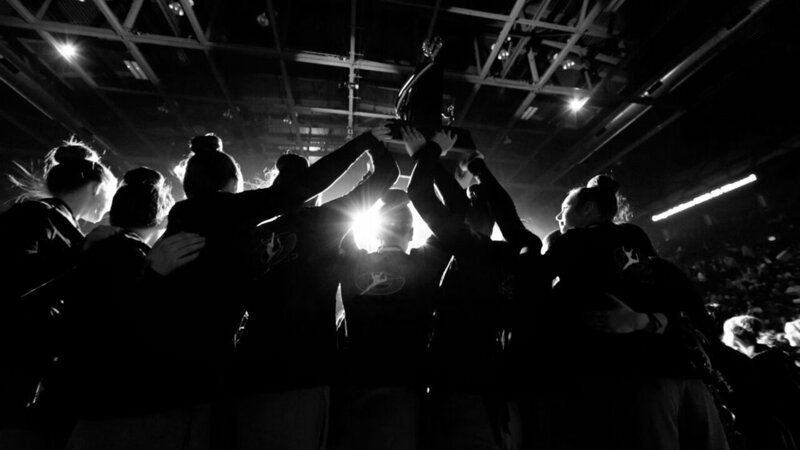 My team would say “Our goal is to make finals at nationals” and I would come back with, “that’s it?” My team would say, “we want to be successful at nationals”, and I would say, “but really… what place do you want to get?” I wanted them to say MY goals out loud. I wanted them to WANT to be national champions. What I have realized over the past 8 seasons is that I cannot make my goals their goals. BUT, I can build a culture where pushing yourself, doing the extra, and making sacrifices comes natural. If you don’t intentionally create the culture, it will create itself (and probably won’t be one that you like). Take the time to create your culture. Allow your team members to have ownership in the process. Use your resources (like the amazing mentors at the Dance Coach Academy). And slowly, but surely, you will see, as I have, that your goals and their goals become one in the same. When your done dancing. When the lights go down, and you've given your last performance.... For some it's relief, for some its an empty feeling. Many have spent their whole lives training, working, and living for the feeling only a performance can bring. You grow up learning how to accept criticism, to work through pain, to strive to be better... every. single. day. Always working. Always Striving. Always moving to the music. The energy vibration a performance can bring. The rush of dopamine intertwined with the love of movement. The encapsulating feeling of the performance is safe and invigorating all in the same breath....that is if you remember to breath. You have a hard time putting into words why you have stuck with dancing your whole life. It mainly comes down to the feeling. The vibration. The music. The smell of the hairspray. The weathered dance shoes. The holey tights that you can never seem to have enough of. The teachers and coaches that have cheered you along the way. The sweat and tears that few are privy to see. The way the stage or gym floor feels below your feet, or the applause after a heart felt performance when you know you left it all out there. You don't have to explain it because other dancers get it. We also get what it's like after you have your last performance. There are no dance teams later in life. You can't go just play a pick up game of dance team at the local YMCA. For some, it can be hard. It's the closing of the last page of the many chapters labeled dance. For every dancer that has had their last performance. Keep dancing. Keep showing up to classes. Keep improving. Choose to share your passion of dance with others through mentoring, teaching, or coaching. Thank you for reading for more inspiration check out Dance Coach Academy Facebook Page. Goal Setting is imperative to the success of a team. These are a few tips that were given in a live Dance Coach Academy Coaches Training Course that we wanted to share. Stay tuned we have a course announcement coming shortly! DEADLINE: Do you prefer to break your season up into sections, or do you want to have a season long goal? Breaking your season up into sections can allow for small victories, which can lead to your season being a BIG SUCCESS. Have one, overarching, season long goal can allow for continuity through the season. INVOLVEMENT: Who do you want to involve in the goal setting process? When you involve your whole team, each individual member has ownership over the process. When athletes have ownership, they are more likely to follow through! Kick off your goal setting process with some inspiration (team-dependent). Make sure that your goals are S.M.A.R.T. Practice active goal setting. You need to not only write the goal, but create the map to get you there! This allows you to problem solve in advance – If you can PREDICT it, you can PREVENT it! Lets you consider outside sources that may be beneficial in achieving your goals! You can use this template to write your initial goals, or once your team has decided on their goals, you can fill these out together! WHAT OBSTACLES MIGHT WE ENCOUNTER? WHAT STEPS WILL WE TAKE TO ACHIEVE THIS GOAL? WHO CAN HELP US ACHIEVE THIS GOAL? WHEN DO WE WANT TO ACHIEVE THIS GOAL? HOW WILL WE KNOW WE HAVE ACHIEVED OUR GOAL? When you are mapping out formations use GRAPHING paper. Yes the kind that many of us used back in math class. It makes for clean straight lines and it makes it easier to see what the formations are supposed to look like. I have seen coaches use huge pieces of graphing paper and quarters that are labeled with each dancers initials. They move the quarters around when mapping out formations and take pictures of each formation. You can also get a large variety of highlighters and give each dancer on the team a color or map out groups of dancers by skills and assign them a color. At the choreography session, have each dancer wear the color you have them highlighted as on your formation/choreography sheets. This will really give you a great visual. On a side note we kick off our coaches training course today. We have over 85 coaches registered. We can't wait to get started. For more information click on the Courses tab. Dance Coach Academy. Behind the Scenes. Dance Coach Academy: How did this all come about. A little back story…. First I should probably introduce myself. My name is Jenna Schneider. I am entering my seventh season at the University of Wisconsin, and had previously coached a high school dance team for seven years prior to that. Let's back up even more. When I was in high school, I went through nine dance team coaches. When I was in college I had three different coaches as well. I wish I was kidding, but I’m not. It was difficult and frustrating transitioning through so many different coaches, but dance was my passion so I took the good with the bad. I learned back then what an impact a coach can have on those they coach. My junior year of college, an opportunity came about to coach my high school team that I had previously been on. They had not had a consistent coach for almost 10 years. I didn’t know how to coach. But I did know that I was passionate about dance and wanted to give the girls the best experience possible. I wanted to become the coach I always wanted to compete for. That first year of coaching was a roller coaster. I felt I didn’t know what I was doing. I would try to read about what other teams and coaches were doing, but there just wasn’t any training out there for dance coaches except for the brief training I received at the dance camp I took my team too. I often felt like I was on an island by myself. With coaching, you are the one in charge. The one that has to make the final decisions. It can be a frustrating and exhilarating experience all wrapped into one. Little by little, I gained my footing through longevity, surrounding myself with coaches I admired, and learning from the mistakes I had made…and in the end, we won a couple national championship titles as well (proud to say the school still has the national championship banners hanging in the school gym…that was a win in itself!). Entering my 13th season(how can that be! ), it is now my mission and my passion to help other coaches become the best coach they can be for their team through Dance Coach Academy Training's. I truly want you to be the best coach you can be…. so in return, you can give the best experience possible for the kids you coach. I am humbled to have such an amazing team of mentors here at Dance Coach Academy. We have the best of the best dance coaches in the country serving as DCA Mentors and I can’t wait to share the training's that we are currently working on for the upcoming DCA coaches training course. Registration officially opens on the DCA website Wednesday June 14th. The private course will run June 26- July 9th. We look forward to the community of dance coaches that will be joining our training where we all will be inspiring each other. Join Our Dance Coach Community! Sign up with your email address to receive tips, coaching strategies, and discounts for our upcoming DCA courses.